CERN’s poplars were planted 50 years ago to soak up the surplus water in the ground beneath the Laboratory’s sites. Now that they have reached the end of their life-cycle, some of the poplars are in danger of falling or losing their dead branches. On Saturday, 17 April, as part of the campaign launched in February at Prévessin, work will start on replacing the poplars on central areas of the Meyrin site. Replanting plan for the Cedars and kindergarten carparks. In July 2009, CERN was awarded an environmental label for its protection of rare flower species and the natural landscaping approach it has taken at its Meyrin site. The Laboratory has a very strict environmental policy: for years those in charge of CERN's green areas have given priority to natural management methods and have avoided the use of pesticides. In addition, patches of land are left unmowed in spring, allowing the local flora—especially the orchids—to grow naturally. 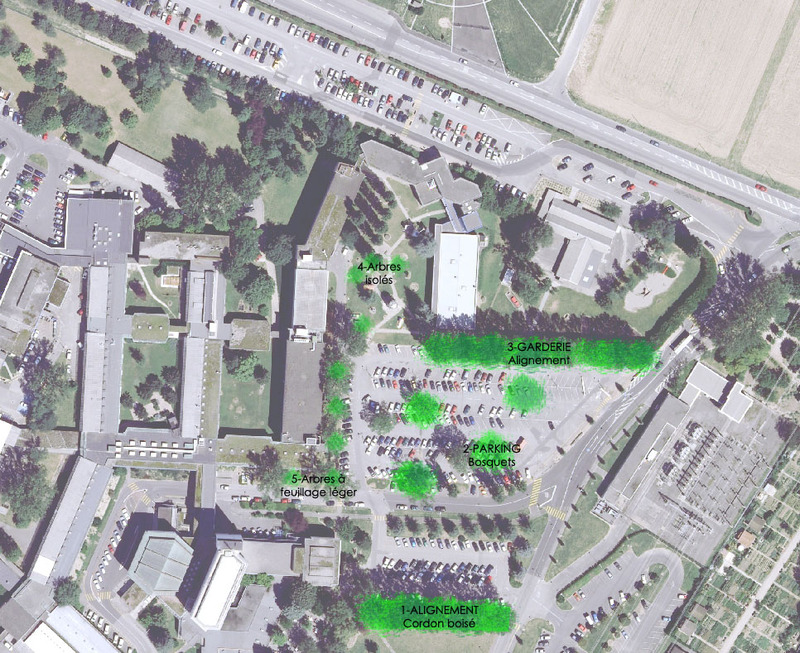 Operations to cut down the poplars representing the greatest hazard will therefore start on Saturday, at 17 April on the car park in front of the entrance to the CERN kindergarten near Gate A as well as around the Cedars car park. To avoid all traffic disruption, the 33 poplars concerned will be cut down over three weekends, 11 each time. A second phase will start in November, bringing the total number of trees cut down to 75 by the end of the year. Replanting with varieties found locally will start in the winter. Replanting operation on the terrace of Restaurant 1 (Thursday, 8 April 2010). Mathieu points out that “For every tree that we cut down, we will plant one and in some cases two new trees. However, trees have to be planted at the right time of the year to take account of their growth cycle. We also have to take account of the cost. So we will plant relatively young trees, which are less expensive.” In addition, trees have to be replanted when they are resting, i.e. when there isn't much sap rising up the trunk. This means that replanting operations are restricted to the period between October and the end of April. “In December we will start planting wild and ornamental flowering cherry trees, red oaks, hornbeams and other varieties that are commonly found in this region.” Then we can just sit back and watch them grow! The trees that have been cut down will be transformed into wood chips for heating.